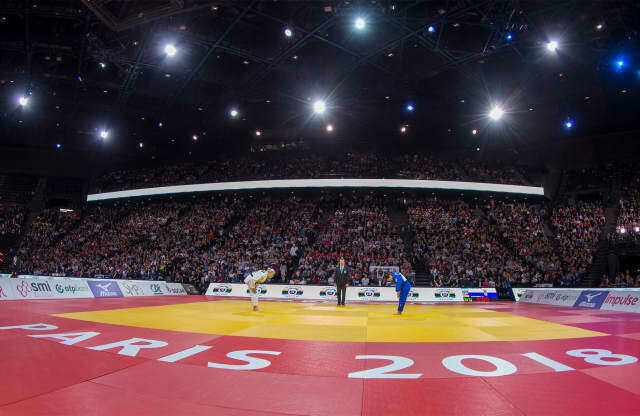 A few weeks after the first Grand Prix of the season, which took place in Tel Aviv, during the month of January, the World Judo Tour is about to invest the French capital, Paris, for its annual first grand slam of the year. It is an euphemism to say that the entire judo planet is waiting for this big event with fervor. Paris, and this is not to offend other tournaments on the world circuit, has a place apart in the heart of the judo fans. Its history, its stories, big and small, and of course the level of competition make this event a special date in the sporting calendar. But beyond the results, beyond the victories and defeats, one of the most striking elements in Paris is the incredible atmosphere that reigns in the AccorHotels Arena during the two-day competition. This is not something new. The one which, a few years ago, was still called the 'Tournoi de Paris', and that the nostalgic people always call so, began its story in the 'magic' cauldron of the Stade Pierre de Coubertin, which hosted the first World Championships organized outside Japan in 1961 and then for several decades the Paris tournament. Considered as the temple of judo in France, the Stade de Coubertin was a kind of grail for athletes and a must see for sports lovers. It must be said that the spectators could, so to speak, almost touch the competitors as the stands were so close to the tatami. All those who had the chance to go to the Paris Tournament in the 70s or 80s, to compete or to attend the competition, keep in mind the vivid memories of the sometimes explosive and electric atmosphere that prevailed then. The Accord Arena was full in 2018. It will again be packed in 2019. When the tournament was relocated to Bercy, because Coubertin was to host another event, a little worry was born: Would the atmosphere be the same in a stadium that can engulf more than 15,000 spectators, while Coubertin welcomed only 4,000? The doubt was quickly forgotten and the challenge successfully won by the French Judo Federation. From the beginning of the tournament in Bercy, the public was at the rendezvous ... even more numerous and more enthusiastic. You must have experienced this, you must have seen that. From the first hours of the day, when the gates of the venue are not open yet, and that often the temperatures are freezing, thousands of enthusiasts come from the four corners of the hexagon, to wait in front of the spectator entrance, to rush into Bercy as soon as possible. Whether the competitions begin at 9 or 10 am, or even earlier when the participation is very high, like this year with the Olympic qualification in line, the public is at the rendezvous. Some have done hours of car or bus, all night, others have opted for the train, the last came on foot or by bike, but what unites them all is the desire to to be there to follow the French judokas obviously, but also the gratin of foreign athletes, for who it is not mistaken to say winning in Paris, is a line that all want to put on their business card. 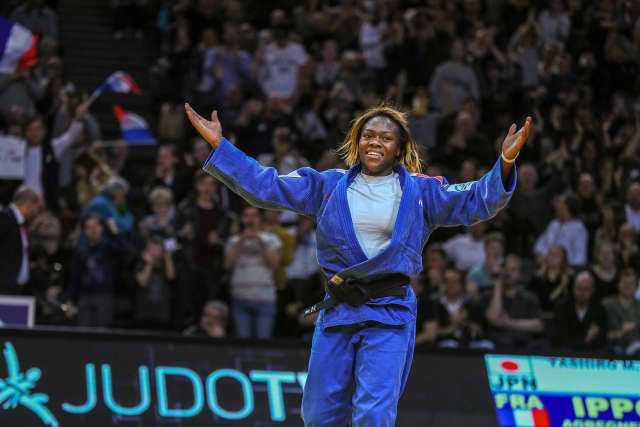 Clarisse Agbegnenou (FRA) supported by the Paris Public in 2018. This public that some would call chauvinist - but is it possible not to be a bit - is also an audience of connoisseurs. Without a doubt, if the stadium could accommodate 50,000 people, it would also do it. Just like judo in France, the seats are filled with young and old judoka, judo teachers with their pupils, former sports glories and hundreds of VIPs, who have only one single idea in mind: to discover beautiful judo, great judo, spectacular, and adulate the champions of today. For those who are interested in judo, it is incredible to be able to walk in the corridors of the AccorHotels Arena, and to meet so many World Champions and Olympic Champions, so many high ranked sensei. Yet people do not come to the Paris Grand Slam to be seen, they come to see and have fun. They come here to comment, to try to find out who will be the next big names of the sport, they also come to learn and discover what very high level judo means. In between rounds, the spectators go to buy a sandwich, to be able to go back to their seat as quick as possible. One must not waste time, one must not miss anything and especially not the entry of national judoka, who undoubtedly have the advantage of playing at home. But winning the Paris Grand Slam remains a difficult thing, French or not. It is a mountain to climb on which many broke their teeth. For all these reasons, at least once in your life, you must have experienced this, you must have felt the stands vibrate and growl, you must have had the impression to hear nothing more than the cheers of the crowd. The Grand Slam of Paris is taking place this weekend, on Saturday and Sunday, and if this year, you do not have the chance to attend, we will share this special atmosphere with you.